Email has become one of the most dominant forms of communication over the past forty years. For many of us, it is the first thing we check in the morning and the most important tool for running our business and personal lives. 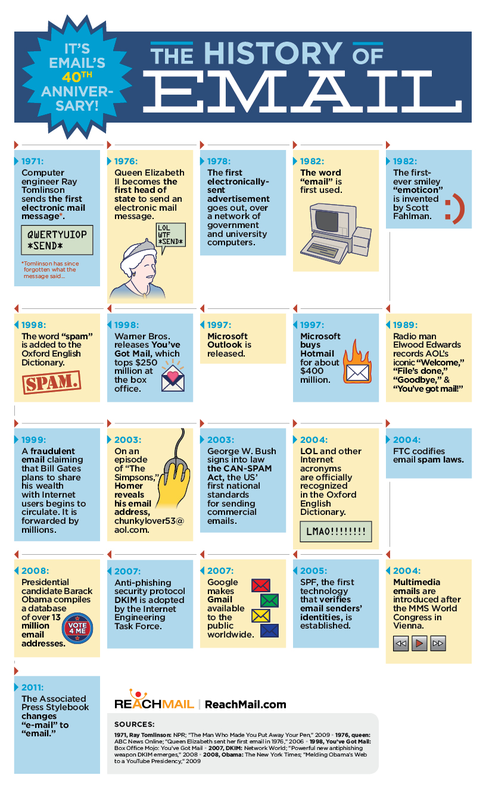 In honor of the 40th anniversary of email, ReachMail, put this infographic together. It details a pretty interesting timeline of a tool which has changed our language and culture. 1971: Computer engineer Ray Tomlinson sends the first electronic mail message. 1976: Queen Elizabeth becomes the first head of state to send an electronic mail message. 1982: The word “email” is first used. 1982: The first-ever smiley “emoticon” is invented by Scott Fahlman. 1997: Microsoft Outlook is released. 1997: Microsoft buys Hotmail for about $400 million. 1998: Warner Bros. releases You’ve Got Mail, which tops $250 million at the box office. 1998: The word “spam” is added to the Oxford English Dictionary. 1999: A fraudulent email claiming that Bill Gates plans to share his wealth with Internet users begins to circulate. It is forwarded by millions. 2003: On an episode of “The Simpsons,” Homer reveals his email address, chunkylover53@aol.com. 2004: LOL and other Internet acronyms are officially recognized in the Oxford English Dictionary. 2004: FTC codifies email spam laws. 2004: Multimedia emails are introduced after the MMS World Congress in Vienna. 2007: Google makes Gmail available to the public worldwide. 2007: Anti-phishing security protocol DKIM is adopted by the Internet Engineering Task Force. 2008: Presidential candidate Barack Obama compiles a database of over 13 million email addresses.